Note, the weight of an arm is substantial. desk top, for example ¾ on the desk top and ¼ over the edge of the desk. The hand can then be comfortably supported by the body of the HandShoe Mouse. 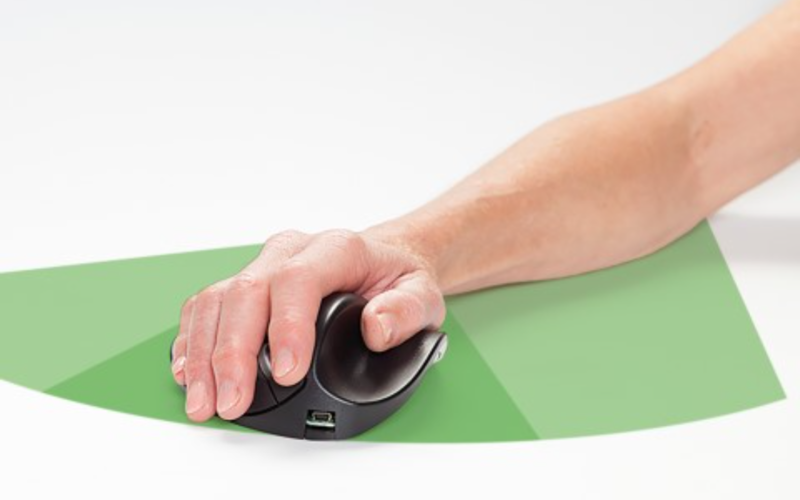 Minimal effort is then required to move the mouse by means of forearm and hand. angle of around 110 degrees with respect to the seat of the chair, while the seat is at 0 degrees. The latter to prevent sliding. One should realize that arm and hand activities have an effect on the Trapezius muscle. However, there is only a partial influence on the Deltoid muscle for example when reaching. So to prevent unnecessary muscle loads one should support forearm, hand and fingers. muscle irritation due to excessively moving the hand sideways (wrist snap). forearm motion will be restricted resulting in excessive wrist (snap) motion. The effect of aging in combination with wrist snap can be dislocation of the Articular Disc. Lower levels of trapezius muscle activation were recorded with the use of arm supports. Wrist supports did not reduce activation. extremity. Arm and wrist supports are introduced at the workplace to reduce the workload. preventive measures to reduce the risk of neck-shoulder complaints. the positive effects of a slanted mouse (palm supporting area at an angle of 25° or 30°). Forearm and shoulder muscle activity will reduce in this position. position, so forearm and shoulder muscle activity will be reduced. associated with less wrist extension. Participants reported less musculoskeletal discomfort when using a support. perspective of findings by other researchers presented in this overview of publications. Publication by Bjarne Laursen et al in Int J Occup Saf Ergon. 2001;7(2):179-93.
are low during computer mouse use when there is efficient forearm support by the table. Publication by Danuta Roman-Liu et al in Clinical Biomechanics 2000;15 Suppl 1:S30-3. and fatigue of the trapezius and deltoid muscles. Ten young men took part in experiments. of the task. Surface electromyography (EMG) was used. involved in a performed task.